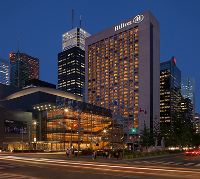 The 2019 Receivables Management Association conference to be held November 13th & 14th, at the Downtown Hilton Hotel, 145 Richmond Street West, Toronto. We would like to invite you all to the 2019 Receivables Management Association conference to be held in Toronto, November 13th & 14th, at the Downtown Downtown Hilton Hotel, 145 Richmond Street West, Toronto. The RMA conference is a great opportunity for the attendees to network in a fun and enthusiastic environment, along with attracting a quality group of speakers with extensive strengths in the industry. This conference will prove to provide a wealth of information from a very diverse and interesting array of guest speakers. Already the conference team has pulled together a strong list of key note speakers. Conference attendees will benefit from the insights of industry leaders, with topics directed to professional development. The conference session page already outlines a number of committed presenters. The networking and the atmosphere of the venue and the coordination of the event will be valued experience to all attendees. Our attendees come from across the globe to participate and we provide a venue that is unique across Canada. The opportunity to participate and interact with our colleagues from all aspects of the receivables management industry and gain this type of experience is limited in Canada. In attendance will be representatives from the major financial institutions, retailers, recovery experts, suppliers, governments, call centres and credit executives from most segments of the industry. Our speakers will touch on everything from global collection challenges, to how to manage stress in our environment. Our government relations partner will bring us up to date with current Federal issues that our affecting our industry and what we can do to prepare for these changes. We have a very interesting line-up and perhaps one of the best we have seen in a long time in Canada. The conference would not be possible without the kind and generous support of our sponsors. Once again Equifax will co-host the event with the RMA as the Title Sponsor. Met Credit has generously offered to be the conference's "Champion Sponsor". A number of organizations have also come forward as Platinum and Gold Sponsors. I encourage our members and industry colleagues to take some time to review the websites of these sponsors and the services they offer. We welcome your participation this year, but please register early to not only get the 'early bird' pricing. More importantly, our conventions have sold out in the past and we do not want you to miss out on this event. As we continue to grow as an organization, I am impressed with the dedication and commitment of all our members to the RMA. The conference has always been an annual opportunity to network with new and old colleagues and identify opportunities where the RMA can better serve its members. Throughout the conference, I invite all attendees to reach out to myself and other board members. Your input is invaluable to future RMA events. I look forward to seeing you at this year's conference and the opportunity to build on the direction and goals of the association. Receivables Management Association of Canada. This year the Receivables Management Association will once again host a silent auction in support of the development of our own Scholarship program that we are currently developing. Our focus going forward is to leverage our brand with our own in-house program for opportunities identified by our Scholarship committee and the Board. Your donations, ongoing support and participation will make this a success. Thank you.